While every homeowner wants to own a lush, green lawn, there may be times when lawn grass needs to be removed because it is unhealthy, not growing according to plan or full of weeds. In such a case, killing the grass and starting over offers the only available option. Kill lawn grass using a chemical herbicide for a quick resolution, or select a natural remedy that takes longer but is safer for people with children or pets. Clear the lawn grass of any rocks, debris, children’s toys and equipment. Mow the existing grass as short as possible. Wet the mowed grass lightly with a garden hose or sprinkler system. Do not douse the area with water, but wet it lightly so the newspapers you will lay over it adhere better and do blow away. Spread a stack of 8 to 10 newspapers over a spot on the lawn. Spread another stack next to it, overlapping the edges by 4 inches. Continue spreading stacks of newspapers this way until the entire area is covered. Each stack should overlap the adjacent ones by 4 inches on all sides. Water the stacks gently so they settle down over the grass, and spread a 3- to 4-inch layer of mulch over them to weigh them down. This ensures they press against the grass further to block out any sunlight and air, thus killing it. 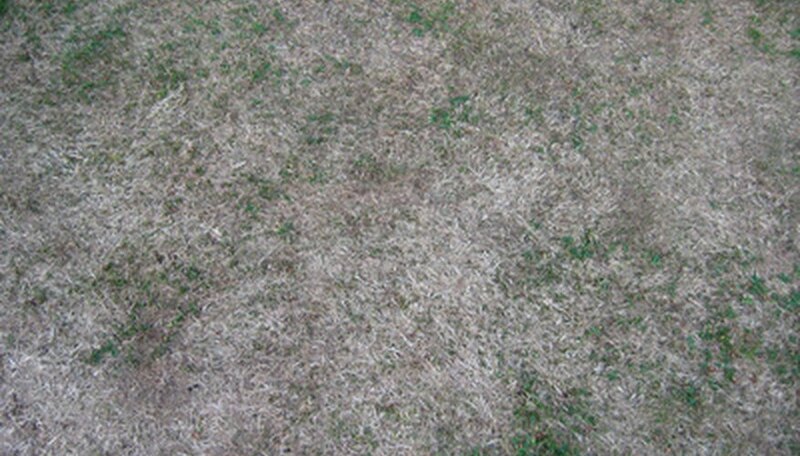 The grass will die in a month to 40 days. Purchase a gallon of grass killer containing glyphosate for every 300 square foot area of lawn. Pour the herbicide into a spray tank, and follow manufacturer's directions while spraying over the existing lawn grass. This chemical alternative kills grass in 2 to 3 days. Check the grass after 2 days and spray any patches that have not died. Rake the dead grass, collect it in a wheelbarrow and discard appropriately. Cover any plants or foliage you do not want to kill with tarp when spraying chemical grass killer. Wear gloves and a facemask when spraying. You can also pour white vinegar directly over grass to kill it naturally.